A fitness scale is an excellent tool for keeping tabs on your progress in the gym. It’s great if you want to check the effectiveness of your weight loss efforts thus far or to get an idea of your muscle mass. But some models can do much more than that. Among other things, the following highly recommended scales can calculate BMI, bone mass, and body mass. And there is even a scale that comes with a dedicated smartphone app. In addition, each one has a different price point so it would be easy to choose the best fitness scale for your budget. The Eufy Smart Scale is designed to take your fitness measurements to another level. It comes with all the technological bells and whistles a contemporary power user might expect. Nevertheless, the Eufy is surprisingly simple to use – just stand on the metal parts and the scale displays your weight almost instantly. In terms of readings, this scale truly excels with 12 different measurements and calculations. 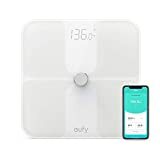 Besides the usual weight, body fat, and BMI, the Eufy Smart Scale logs BMR, visceral fat, and lean body, water, and bone mass. In addition, the Eufy keeps an automatic record of all the measured data and gives you the option to set up to 20 user accounts. This is all made possible by the EufyLife smartphone app. The scale is Bluetooth 4.0 enabled for connection with a phone and the app. In turn, you get an easy-to-understand graphical display of your progress. On top of that, you can sync the Eufy to your Fitbit, Apple Health, and Google Fit. In a sense, these features make it the ultimate scale. For the weight measurement, this model uses 2 pairs of extra sensitive FDA-listed sensors, one on each side. They are calibrated to measure between 11 and 397 pounds – which covers a great variety of users from kids to NFL linemen. As you might expect, the scale only displays the measured weight and you get all the other calculations on the app. On the upside, the display is quite large so you won’t have to lean down to read the numbers. This fitness scale and body analyzer has a sleek, minimalist design at a reasonable price. There is no Bluetooth connectivity or app, but this doesn’t make the My Life My Shop (MLMS) any less smart. To be precise, the MLMS scale can keep track of 8 different users and comes with the company’s sense-on technology. In addition, using and setting up this scale is straightforward. The Set and Select Up/Down buttons are located in the upper right corner. Hit up or down to look up measurement history. After weighing, the scale calculates bone and muscle mass, body fat, and water weight. On top of that, it also shows you hydration levels, BMI, and bone density. All the readings are clearly displayed on an LED display and most of them are indicated by small icons. To use the scale, you press the Set button and step on the side plates. After your weight is displayed, you have to wait a few seconds to get the other readings. Once you step off, the scale automatically records the readings and shuts off. Among other features, the MLMS is also quite compact and lightweight – it measures 1.6 x 14.3 x 14 inches and weighs about 5 pounds. Lastly, this scale measures up to 397 pounds, which puts it next to some of the more expensive models. OUR GUARANTEE: Triomph is a French brand with 25+ years of history, we stand by our products 100% with 1-year guarantee, 30-days money-back service and lifetime support. Local U.S. Customer Service based office. Triomph Precision is among the most popular fitness scales out there are for a good reason. It is accurate and can make a few body fat calculations at a low price point. But don’t let the price fool you. This model excels at its intended purpose and comes with a 1-year manufacturer’s guarantee. The scale uses state-of-the-art BIA technology for accuracy. You probably expect it to measure and calculate weight, muscle, and body fat. But with bone mass, calorie, and water data as well, this model comes close to some of the more expensive options. 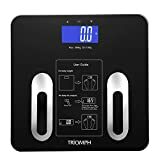 Unlike most budget models, the Triomph fitness scale sports a number of certificates – FCC, CE, and ROHS, to be precise. And it features a 24-bit conversion chip which allows the scale to calculate and look up references with greater speed and precision than the competition. On top of that, this is one of the most durable models around. It’s made of a combination of tempered glass, ABS plastic, and stainless steel. These design elements also add to the aesthetic appeal of the unit and there are four color options to choose from. With the ability to store 10 users in its memory, this scale is quite usable as well. On top of that, if you are bilingual, there are three built-in languages (English, French, and Chinese). All the readings are displayed on a 3.15 x 1.57” backlit display. It could be a bit bigger but that’s a small compromise considering this low price. A concise user guide is printed right on the unit. No matter which model you choose, you’d be getting the best fitness scale for your needs. But if you want the best of the best, the Eufy Smart Scale is well worth the money. It works with smartphones and apps and is FDA certified for accuracy and capable of making a range of calculations. On the other hand, you can hardly go wrong with the Triomph Precision scale if you are concerned about your budget. This scale is small, affordable, and calibrated to keep track of your fitness progress.